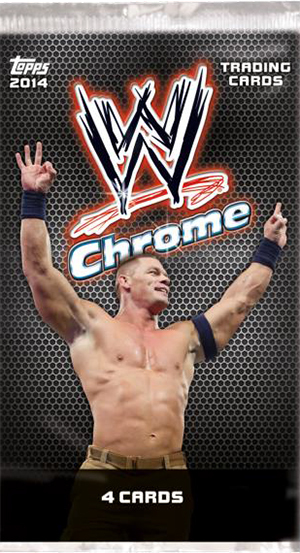 Chrome is back for wrestling collectors in 2014 Topps Chrome WWE. 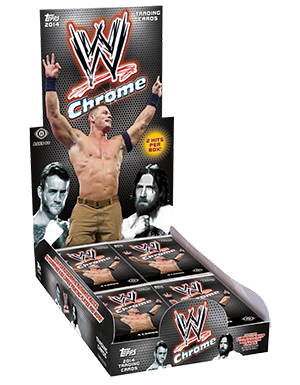 The Chromium product includes two hits per box and a variety of inserts. 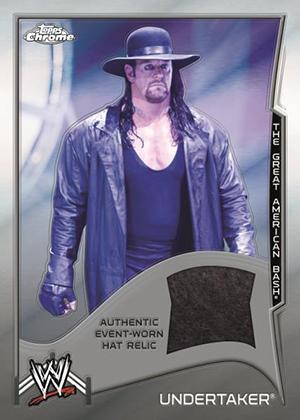 The base set includes 110 cards and features Superstars, Divas, Legends and Rookies. Collectors can also find Refractor parallels, including base Refractors (1:3 packs), Red Refractors (#/199), Hobby-only Gold Refractors (#/50), and Superfractors (1/1). 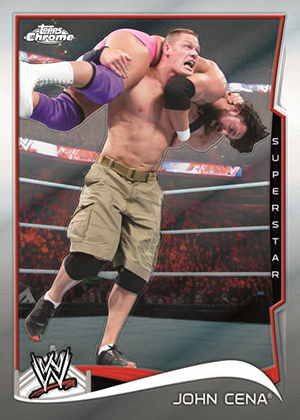 The base card images will be the same as those found in 2014 Topps WWE Wrestling. Also applying a Chrome finish to the 2014 Topps WWE images, NXT Prospects pays homage to the top 20 minor league Superstar and Diva wrestlers. 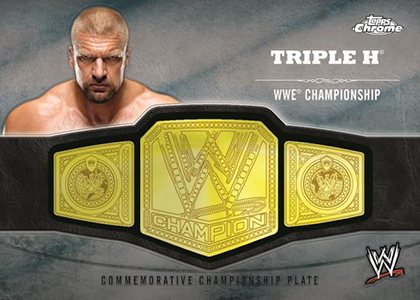 WWE Champions includes new cards that fall 1:6 packs. 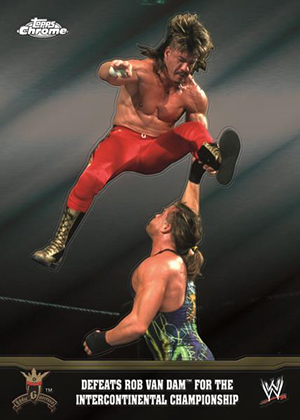 Jerry Lawler's Legends will also include ten new cards and can be found 1:12 packs. All three inserts combine to fall 1:2 packs. Lastly, a total of 760 Printing Plates are available for the base and insert cards. 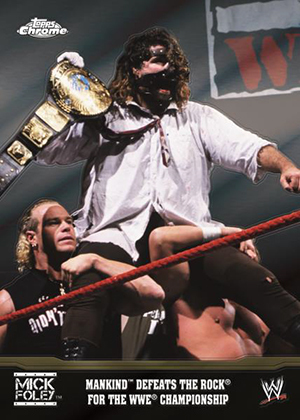 Chrome Championship Medallions kick off the hits with 30 subjects and six different belts. Individual print runs are not known, but there are a total of 4,000 cards. 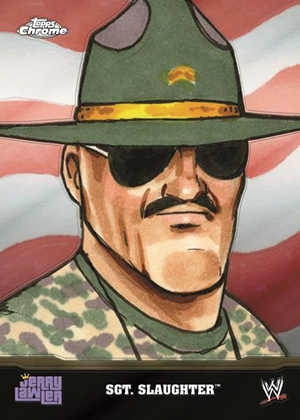 Signed cards are also available and are headlined by on-card Autographs. The base version includes 3,000 total cards. Refractor (#/50), Red Refractor (#/25), Gold Refractor (#/10 - Hobby), and Superfractor (1/1) parallels add to the totals. Dual Autographs pair two wrestlers and includes four different cards. Relic cards are highlighted with Swatch Relics and Mat Relics. Chrome Swatch Relics feature pieces from Superstar and Diva clothing. 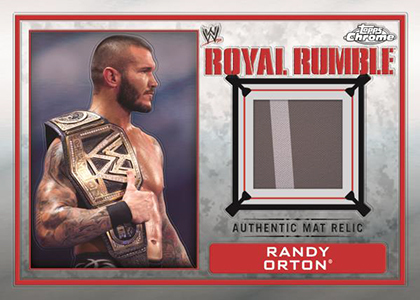 Chrome Mat Relics contain a piece of the mat from the 2013 Royal Rumble event. Each relic insert includes 4,000 total cards. Last, but not least, Chrome Diva Kiss Cards include 800 total cards and Chrome Autographed Diva Kiss Cards are limited to just 50 total cards. 30 cards. Topps has confirmed short prints (SP) have 25 copies each. Extremely weak autograph checklist and can use some more legends. Would have loved to see a HOF subset or insert set.